In the exhibition ‘Sehebenen’ Maartje Fliervoet was guided by the 19th-century plaster death mask La noyee the Seine or l’Inconnue de la Seine to produce wide-ranging investigation researching a large number of connections. The mask caused a beauty craze at the end of the 19th century. The woman to whom the face belonged, would have thrown herself into the Seine to die from heartbreak. Due to her beauty and serene expression the morgue decided to have a cast made of her face. This Ophelia-like myth continues to exist, despite her later unmasking: because of her smile the mask could never have been from a drowning woman. The mystery that has surrounded the death mask has produced a quite extensive literary production including references by Maurice Blanchot and Rainer Maria Rilke. Fliervoet examines the egocentrism in texts which completely bypass the real woman behind the mask. On the one hand, the story has been overvalued but on the other, the self-interest of the writer who used the myth for his own ideas plays a large role. 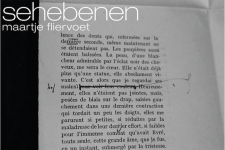 In her work on Le Corbusier [Entropy, 2010], Fliervoet appropriated common perspectives of the masculine ‘creative’ powers; in ‘Sehebenen’ this has been done through the appropriation of manuscripts and editing symbols from both Blanchot and Rilke. Both writers have contributed to the preservation of the myth of L’Inconnue de la Seine through idealization. In addition in ‘Sehebenen’ Fliervoet returns to the Paleolithic art as an early manifestation of the [mimetic] creative process. * “Sehebene” [‘ eld of view’, plural ‘Sehebenen’] refers not only to a surface on which elements can come together, but also where various components can be integrated, for example the interpenetration of gure and background in a pattern. This German word appears in the Spätrömische Art Industry of Alois Riegl in 1901 – an “emancipating” study of late antique decorative art. In ‘Sehebenen’ this is translated to merge source material and other contributions. Maartje Fliervoet has exhibited extensively, locations include: A.VE.NU.DE.JET.TE Institut de Carton and Wiels CAC, Brussels, Grim Museum, Berlin, Local 01, Antwerp, Kunstverein Göttingen and SKOR, Amsterdam. She is a tutor at the honors-program ART and RESEARCH of the UvA and the Gerrit Rietveld Academie. She recently concluded a working period at the Frans Masereel Centre, where some of the work shown by BRADWOLFF PROJECTS, were produced. Other residencies in which Fliervoet participated are: Air Berlin Alexanderplatz , Wiels CAC , The Banff Centre . Maartje Fliervoet is the initiator of the newly established Manifold Books. The exhibition is the result of the research that Maartje Fliervoet has done at LAPS of the Gerrit Rietveld Academie.